We always know it’s the start of a brand new month with the release of Google’s newest Android distribution numbers. There’s some good news for the two-week period ending March 4th — devices running Android 4.0 or higher are now the majority of the Android platform. 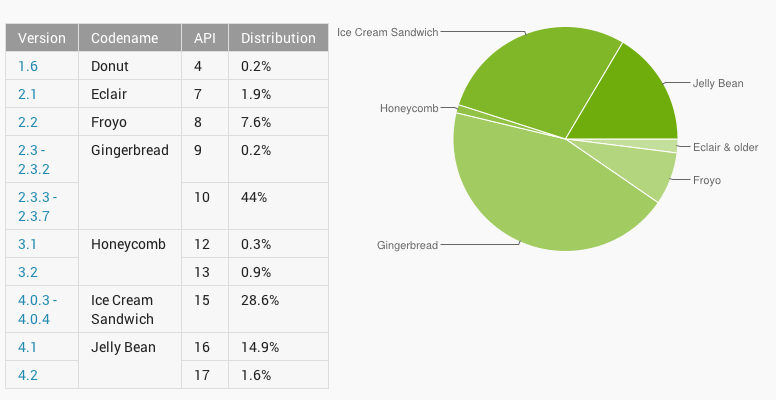 With Ice Cream Sandwich holding 28.6% and Jelly Bean with 16.5%, Android 4.0 overtakes Gingerbread’s 44.2% of the Android pie. Amazingly, Donut, Eclair and Froyo still make up a combined 9.7%, with Honeycomb still out there on 1.2% of Android devices. All totaled, Jelly Bean rose 2.9% from February as Ice Cream Sandwich dropped 0.4%. Gingerbread dropped another 1.4% even as low-end Android devices are still introduced on the platform. With Google to introduce Key Lime Pie as Android 5.0 as Google I/O in the coming months, just how much will this chart change? We’ll find out soon enough. Yeah, and once KLP starts rolling out, it too will likely happen at a snail’s pace, and it will take just as long for Android 5.x to overtake 4.x as it did for 4.x to overtake 2.x! Seriously, I think Google MUST change their distribution system and start taking direct control of the process. Seriously: With Apple, whenever there’s an iOS update, it just HAPPENS–Apple posts it, and it IMMEDIATELY starts rolling out to ALL iPhones that have hardware capable of running it. With Android, it’s always “We can’t do it because the manufacturers need to update their proprietary, differentiated UI dressing,” or “We can’t do it because the carriers need time to update all their added bloatware,” or “We can’t do it because the carriers haven’t tested it fully!” Even leaving aside arguments about the hardware manufacturers, why is it that Apple never has to make concessions to the carriers like we saw them do with the Verizon and Sprint versions of the Galaxy Nexus? specs so each product needs to be tested individually unfortunately. Still keeping my S1 Vibrant on Froyo and using it as a wifi media player after getting my note 2! Until you get that “Low internal memory” message lol. It’s no iPod. When analyzing this chart every month, people always fail to realize that 2.3 was basically the only choice for an extended period of time. (thanks honeycomb!). 2.3 got all the way up to x.7. I don’t think we’ll ever see that again. With semi-annual major updates, no version will ever get the traction that 2.3 did. So in my mind it’s only logical that so many phones are on 2.3. Some of these phones started on 2.1 and topped out at 2.3, and apparently people are happy enough with them to not upgrade. Phones that started at 2.3 and weren’t upgraded to 4.0 is another story. – 2.3 was an excellent version of Android, unquestionably the highest quality of the non-post-tablet (3.x/4.x) versions. – 2.3 had significantly lower hardware requirements than the 4.x series, and so was put on budget phones long after ICS was released. I think if it wasn’t for the fact that technology is advancing at such a rate that today’s top of the line phone is going to be, one year from now, the standard for “cheap”, we’d be seeing 2.3 around for a much longer time. As it is it’s only now being phased out. And somehow that feels like a sad thing, something I can’t say for 2.2, 2.1, or any of the earlier Androids.